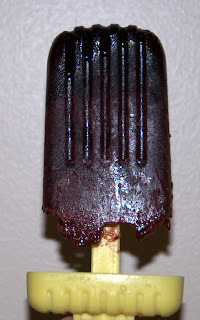 When I saw cherry cola popsicles on Tasting Table, I simply had to have them. So much so that I rushed over to Amazon and purchased my very own Tovolo popsicle molds. I was lazy and wanted to use what I had on hand otherwise, so I adapted the recipe just a bit to what you see below. If you go to the Tasting Table site, you will note their photo is far, far lovelier than mine. Never mind that, it was still a wonderfully yummy frozen treat. I loved the sweet fresh cherry flavor and the familiar combination of cherry and coke in a new format. I had some leftover pureed cherries, so I mixed it with the leftover Mexican coke and had one helluva real deal cherry coke, too.